Mombasa — Tourism Cabinet Secretary Najib Balala has announced that the ministry has cancelled the Sh20mn sponsorship to the national rugby sevens team, saying they embarrassed the country by blocking the 'Make it Kenya' brand during the Paris leg of the World Sevens Series. 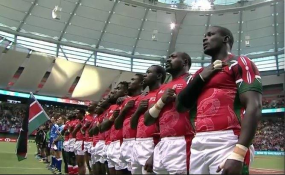 A row erupted between Brand Kenya and the Kenya Rugby Union after players taped out the 'Make it Kenya' Brand during the Paris 7s in protest over lack of payment. "This has gone into funding more priority needs of the team such as player allowances for the London and Paris legs, Accommodation and Airfare for the extra management carried on the tour and outstanding training allowances," the Union said in a statement as it made an effort to clean up the mess. It added; "What is due to the players is Sh2.5mn which will be paid as soon as additional installments or money from other sources is received by KRU." However, the minister's word on Thursday now puts all that into jeopardy. It brings the Union into another financial crisis with the team set to compete at next month's Rugby 7s World Cup in San Francisco, United States.